The artist, Erwin Aichele, (Hohefeld 1887 - Pforzheim-Eutingen 1974) displayed a passion for observing and drawing animals from an early age. After a traditional education, he studied fine art at the Academy of Fine Art in Karlsruhe. He then continued his studies in Munich with Heinrich von Zugel, at that time one of the most celebrated animal artists in Germany. In 1911, Erwin Aichele passed his art teaching diploma and started work at the jewellery school in Pforzheim. From 1915-1918, he was a soldier in France. For some of this time, he had the opportunity to work as an official war artist. To this day, there exists an important collection of his war sketches. Back in Germany, he resumed his teaching activities at the Pforzheim jewellery school and also began painting again. In 1934, he was put in charge of the animal drawing class at the Academy of Fine Art in Karlsruhe. Between 1936 and 1944, he held the post of professor of this academy. 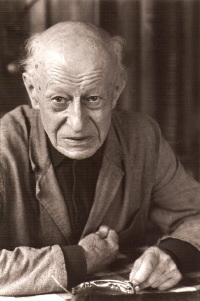 In 1940, he left the Pforzheim jewellery school in order to teach at the town’s School of Decorative Arts. He was to teach here until 1952 and was director of the school for some of this time. The family house in Eutingen near Pforzheim - where Erwin Aichele lived with his wife and three children from 1931 onwards - had an adjoining atelier and animal enclosures. 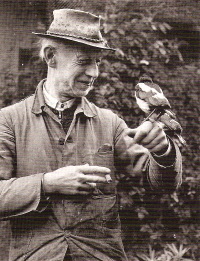 These allowed him to keep all sorts of animals, which were to play an essential role in his life and work. In 1921, he participated for the first time in an exhibition at the Glass Palace in Munich. Afterwards, he took part in many other group shows. His work was also displayed in solo exhibitions, especially in southern Germany, where he was particularly appreciated. In 1974, he was made honorary citizen of Eutingen. In 1988, the Society of Fine Art in Pforzheim honoured him with a retrospective: to mark the occasion, the publishing house, Hans Schöner, published a monograph with a selection of reproductions of his works. Crédit photos : A. Swarowsky.